Documenting learning strategies for the uncertain and exciting future. Lesson starts: Begin a lesson with a short review of previous learning. These steps are summarised in the figure below. The rest of this blog uses Barak Rosenshine’s Principles of Instruction to outline how a typical lesson would be delivered according to the students’ current stage of mastery. 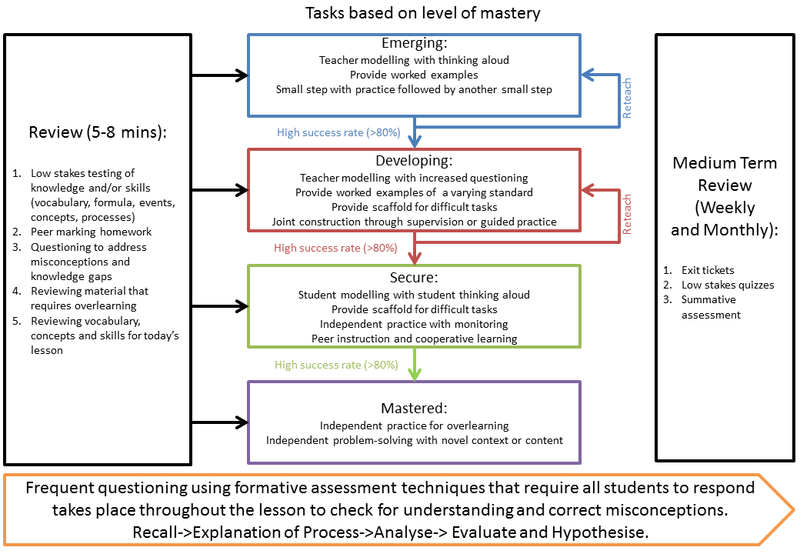 In the first lesson of (say) a 6-lesson unit of work, the majority of students will be in the “Emerging” stage of mastery, understanding between 0 and 25% of the concepts required to reach mastery. The lesson should start with a Do Now, a review of prior knowledge which allows students to connect to this lesson’s content. Following the Do Now, the teacher should then model the thought processes for the new concept or skill. Collins et al state the importance of making the teacher’s thinking visible by thinking out loud in the process known as Cognitive Apprenticeship (Collins, et al., 1991). In applying Cognitive Apprenticeship to Computing, many of the tasks we perform involve implicit steps or thinking. An example of this is closing a tag in HTML as soon as we open it. We would model this by stating that “HTML Tags generally occur in pairs and therefore it is good practice to create a closing tag immediately after creating an opening tag.” Later in the lesson, the teacher would check that students have internalised this habit by modelling the creation of (say) a paragraph, opening a <p> tag and then asking students “As I’ve opened the <p> tag here, what should I do immediately, before I even write my paragraph?” The teacher should expect any student to be able to tell them that a closing </p> tag should be created. Unless we make these implicit habits explicit, our students will be lost as they will not be able to make the invisible conceptual leap that exists in the minds of their expert teacher. The teacher will follow up teacher modelling with a worked example, presenting a finished product so that students know “what a good one looks like”. This is the model which they will judge their work against. They will know if they are on the right track by referring mentally or literally to the teacher’s model. Based on Rosenshine’s research, for new material the construction process should be broken down into small steps with student practice after each step. If for example, students are studying spreadsheets, students should not be presented with four different functions to use in formulae along with formatting and the creation of graphs in one lesson. Rather, the first lesson might focus on arithmetic operators and a spreadsheet might be designed which allows for practice of individual arithmetic operators before moving onto formulae which combine several operators and brackets. For each of the lessons, Rosenshine advises that students should be attaining a high success rate in their guided and independent practice. Students should be attaining success rates of 80% on their practice tasks. One way to gauge what the class’s current success rate and level of understanding is to stop the students after a set amount of time, model the correct processes and solutions on the board and asking students to mark their own work. At the end of this modelling and self-assessment, pupils may be asked to raise their hand if they achieved 50%, 60%, 70% 80% or more. If it is clear that students have achieved a high success rate the teacher can launch the next task or increase the complexity of the current task. Likewise, if it is clear that very few have achieved a high success rate, then the teacher may want to clarify some misconceptions. By the end of the first lesson, students should be developing a sense of mastery and at this stage teacher modelling should be punctuated with increased questioning. The process of modelling at this stage will involve deconstruction of the task, activity or process. Royce Sadler who has researched this area extensively advises that exemplars should be used during the modelling process and that these should be authentic pieces of student work of varying quality (Sadler, 2002). John Sweller is another highly-respected researcher who has spent over thirty years researching Cognitive Load Theory. During this time he has also written extensively about worked examples vs. problem solving. In a recent essay, professor Sweller discusses the benefits of showing highly variable worked examples (Sweller, 2016), referencing the work of Paas and Van Merriënboer (Paas & Van Merriënboer, 1994), he states that learners who encounter highly variable worked examples learn more than those shown more similar worked examples. The differences in quality allow students to truly understand what is meant by quality, it makes abstract specifications and criteria more concrete. There is no substitute for exemplars; Sadler emphatically states that exemplars covey messages that nothing else can. In the second or third lesson of the unit, the teacher should still be providing scaffolding for difficult tasks. However, the intention should be that the scaffolding will be removed once the students achieve a high success rate. At this point, students should have the opportunity to complete joint construction through supervision or guided practice. This guided instruction and collaboration is supported by Pearson & Gallagher’s Gradual Release of Responsibility Model (Pearson & Gallagher, 1983) along with Lewis & Wray’s research into literacy (Lewis & Wray, 2000) and Gibbons work on reading, writing and language acquisition (Gibbons, 2002). As students develop their level of understanding, it is worth closing the lesson with a formative assessment in the form of an exit ticket or low stakes quiz. By the third or fourth lesson in a six-lesson unit, in order for modelling to be truly effective, we need to encourage students to analyse the exemplars and form their own opinions of quality; by being able to judge quality accurately, students will be able to judge and improve the quality of their own work during independent practice. After initial teacher modelling, To and Carless recommend critical peer dialogue as an effective way of students participating in this deconstruction and reconstruction process (To & Carless, 2016). To and Carless found in their research that peer dialogue and critique can provide a more supportive environment for peers to ask questions about an exemplar thus greatly increasing participation. For reserved students and students who may still fear failure in front of a whole class, pair or small group discussion allows students to make their opinions without fear of judgement from their peers. One area worth guiding students with is identifying weaknesses in exemplars as students generally gravitate towards identifying strengths and rarely identify weaknesses. Who is the intended audience for this piece of work? How has the student ensured their work is user friendly and suitable for the audience and purpose? How many marks would you give this student and why? What keywords and technical vocabulary has this student used? What technical vocabulary should a student be using in this answer? What might be a more efficient way of doing this? What data structure could they use for this data set? State three things would you do to improve this program/poster/report/essay/answer? State three strengths of this program/poster/report/essay/answer? What feedback would you give this student to improve their work? This piece of work scored five out of seven what is missing to ensure the student gets full marks? Are there any questions you wish to ask about the exemplars? Why do you think the student has used this formula here? Can you explain their thinking? What is the graph trying to show? How successfully has the student done this? How could it be improved? If you were to pick out the strongest sentence or argument from this paragraph, what would it be? What did you like about this film trailer? What three techniques has the student used effectively to communicate the genre of their film to the audience? List the graphic design rules and principles each of these exemplars have used? What are the similarities between the different exemplars? How might this exemplar be better or weaker than your own? Can you summarise the key differences between the three exemplars we have looked at this morning? The use of teacher-led modelling, peer discussion and individual deconstruction can take place during any unit of work. These varying methodologies do not necessarily need to take place in a linear sequence as the benefits of each methodology can be reaped regardless of the stage of mastery. However, one key finding based on experience and the literature review is that the choice and range of exemplars do need to be planned in advance. As students move from novice to expert, the guidance provided to students should be gradually reduced (Renkl & Atkinson, 2003). Whilst problem solving is a one of the key elements of Computational Thinking and is one of the skills encouraged by Knight and Benson (Knight & Benson, 2014) and Nuthall (Nuthall, 2007), Sweller and researchers who have built on his Cognitive Load Theory have found that problem solving tasks are not suitable for novices during their initial stages of cognitive skills acquisition as they will experience cognitive overload (Sweller, 2016). Once a novice has developed their understanding and skills through varied worked examples, these learners’ intrinsic cognitive load will decrease, allowing them to be exposed to problems which they are required to solve. Renkl and Atkinson go on to state that these initial problem solving tasks will require scaffolding. Through gradual fading of both worked examples and scaffolding, students should complete problem solving tasks independently. Rosenshine notes that whilst independent practice should be extensive and successful in order for skills and knowledge to become automatic, this independent practice should still involve monitoring. Brief monitoring of no-more than 30 seconds is appropriate. However, formative assessment can also be used to check the understanding of the whole class. The expert teacher does not simply follow a rigid lesson structure and plan; the expert teacher will elicit feedback through frequent questioning and formative assessment techniques throughout the lesson and adapt their instruction accordingly. The use of formative assessment strategies by teachers is similar to the strategies employed by football managers, pilots and heart surgeons. Whilst all the aforementioned professionals approach their operations with a plan, this plan is adapted in real-time. In aviation, when a pilot checks their instruments and discovers that they have deviated from the flight plan’s destination, the pilot makes a course correction. The pilot checks these instruments regularly, not just towards the end of the flight. Similarly, in teaching, expert teachers should be regularly checking that their students are on track to meet their destination and if not, the teacher should introduce a form of intervention to change their student’s trajectory and ensure a high success rate. The formative assessment should not take place only at the end of the lesson as this does not leave sufficient time to offer immediate corrective feedback for students to act on. An expert teacher’s classroom is a responsive classroom and the corrections to the lesson delivery are made throughout the lesson. At this secure level of mastery, teachers can also rely on peers to provide feedback, correction and instruction. Pair programming is an example of a cooperative learning and peer instruction which is supported by research and industry (Williams & Kessler, 2002) (Hannay, et al., 2009) (Denner, et al., 2014) (Franklin, 2015). The theory behind pair programming is that the programmer (driver) is required to think aloud and the observing peer (navigator) should review the program, offering advice and feedback based on the driver’s programming and thought processes. As both students regularly switch roles after timed intervals, their shared knowledge and understanding allows them to achieve more than if they were to program separately. The Gradual Release of Responsibility model (Pearson & Gallagher, 1983) states that students should move from teacher-led learning to student-led learning. At this final stage of mastery, Rosenshine states that independent practice is necessary in order to build fluency. The teacher plays an increasingly passive-role with much less intervention and much more observation and monitoring. Learners at this stage should be independent in their thinking and application of knowledge and skills. The independent practice in the form of overlearning is what leads to fluency and automation. Rosenshine’s research suggests that the material used in independent practice may involve slight variations in the material covered during guided practice. In a Computing classroom, these variations might involve subtle changes in context or content for example re-designing a poster for a different audience or using a similar selection algorithm for slightly different conditions. At the end of each unit of work, there should also be a summative assessment which tests the students’ stage of mastery by asking them to apply their skills or knowledge to a new scenario or context. These assessments should be conducted in exam conditions and should mirror the assessment requirements at GCSE or A-Level as closely as possible. In many cases, exam boards will release their old exam papers and also supply some specimen exam papers for new specifications. Teachers are encouraged to use these official materials wherever possible to ensure that the assessments are rigorous, accurate and appropriate. Following a summative assessment, students should spend at least one lesson reviewing their assessment. It is here that the teacher should design resources and activities to correct misconceptions and misunderstandings. Some teachers like to have a digital mark book which directly feeds into a Personalised Learning Checklist (PLC) for each student. 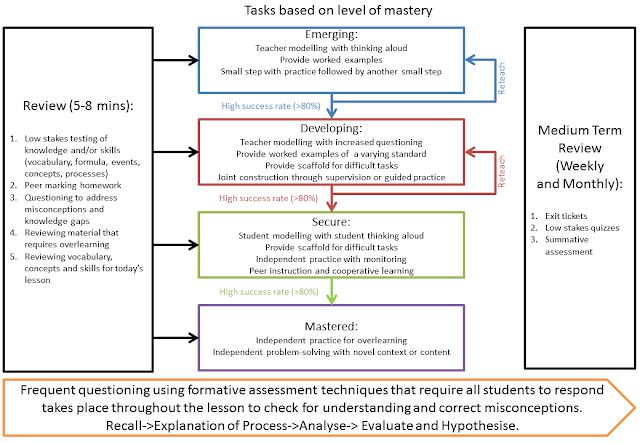 Dr Jasper Green (Network lead for Science at Ark Schools) suggests an alternative approach which is marking an assessment with mark scheme at hand and annotating this mark scheme with misconceptions, it soon becomes apparent where the common misconceptions are for a certain unit and what these misconceptions are (Green, 2016). Indeed, a combination of the two techniques can be used to record and analyse misconceptions. This is an excerpt from Teaching Computing in Secondary Schools. The full text is available from Routledge and Amazon. Baxter, M., Knight, O. & Lau, W., 2016. GFS Teaching Handbook, London: Greenwich Free School. Carless, D. & Chan, K. K. H., 2016. Managing dialogic use of exemplars. Assessment and evaluation in higher education, 20 July, pp. 1-12. Collins, A., Holum, A. & Seely Brown, J., 1991. Cognitive Apprenticeship: Making Thinking Visible. American Educator: The Professional Journal of the American Federation of Teachers, 15(Winter), pp. 38-46. Denner, J., Werner, L., Shannon, C. & Ortiz, E., 2014. Pair Programming: Under What Conditions Is It Advantageous for Middle School Students?. Journal of Research on Technology in Education, 46(3), pp. 277-296. Franklin, J. P., 2015. Perceptions by young people of Pair Programming when learning text languages, London: Axsied / King's College London. Gibbons, P., 2002. Scaffolding Language, Scaffolding Learning. Portsmouth, NH: Heinemann. Hannay, J. E., Dybå, T., Arisholm, E. & Sjøberg, D. I., 2009. The effectiveness of pair programming: A meta-analysis. Information and Software Technology, 51(2009), pp. 1110-1122. Kingsbury, G. G., Wiliam, D. & Wise, S. L., 2011. Connecting the Dots: Formative, Interim and Summative Assessment. College Park, Maryland, Northwest Evaluation Association (NWEA). Knight, O. & Benson, D., 2014. Creating Outstanding Classrooms. Oxon: Routledge. Lewis, M. & Wray, D., 2000. Literacy in the Secondary School. London: David Fulton Publishers Ltd.
Nuthall, G., 2007. The Hidden Lives of Learners. Wellington: NZCER Press. Paas, F. G. W. C. & Van Merriënboer, J. J. G., 1994. Variability of Worked Examples and Transfer of Geometrical Problem Solving Skills: A Cognitive Load Approach. Journal of Educational Psychology, 86(1), pp. 122-133. Pearson, P. D. & Gallagher, M. C., 1983. The Instruction of Reading Comprehension. Contemporary Educational Psychology, 8(3), pp. 317-344. Renkl, A. & Atkinson, R. K., 2003. Structuring the Transition From Example Study to Problem Solving in Cognitive Skill Acquisition: A Cognitive Load Perspective. Educational Psychologist, 38(1), pp. 15-22. Rosenshine, B., 2012. Principles of Instruction: Research-Based Strategies That All Teachers Should Know. American Educator, Issue Spring, pp. 12-39. Sadler, D. R., 2002. Ah! … So That’s 'Quality'. In: P. L. Schwartz & G. Webb, eds. Assessment: Case studies, experience and practice from highereducation. London: Kogan Page, pp. 130-136. Sweller, J., 2016. Story of a Research Program. Education Review, 10 February, Volume 23, pp. 1-19. To, J. & Carless, D., 2016. Making productive use of exemplars: Peer discussion and teacher guidance for positive transfer of strategies. Journal of Further and Higher Education, 40(6), pp. 746-764. Williams, L. & Kessler, R., 2002. Pair Programming Illuminated. Boston, MA: Pearson. 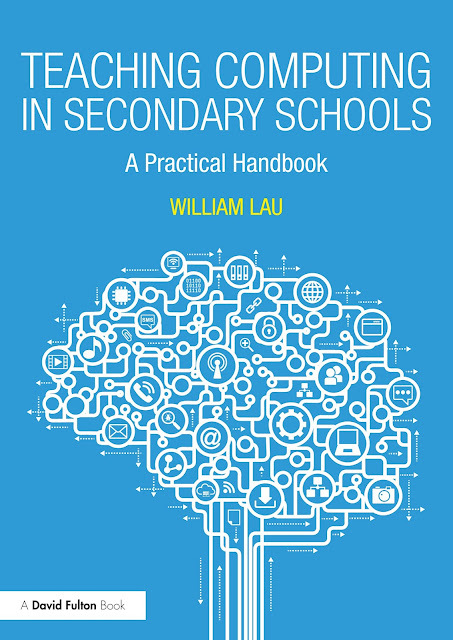 The blog has been a bit quiet over the past 12 months as I've been working on a new book entitled "Teaching Computing in Secondary Schools". It is due to be published in autumn 2017 by Routledge and a sample extract is below. I will also be presenting on curriculum planning in computing at the Computer Science in action conference on November 17th. The event is hosted by The Guardian Education Centre and Further details here. This article originally appeared in Terry Freedman's Digital Education Newsletter in July 2016 and was published to his site in October 2016 . I was invited to write an article to discuss my experiences of teaching Computing over the last ten years. I am grateful to Terry Freedman for his editorial advice and for providing a platform for the original article. It is reproduced below as it appeared in the Digital Education Newsletter. Looking back on the last ten years, I’ve learnt a significant amount about teaching and pedagogy. Based on Kenneth Boulding’s statement, this implies that I’ve failed on numerous occasions whilst teaching Computing. This is true and these mistakes are something I’ve learnt to embrace and reflect on somewhat obsessively. Doug Lemov, in his brilliant book Teach Like a Champion* covers a technique called “Excavate Error”. He encourages teachers to “Dig into errors, studying them efficiently and effectively, to better understand where students struggle and how you can best address those points”. I think there’s great mileage in this technique, not only to help our students but also to help ourselves as reflective teachers. In this article, I will look at five mistakes I made whilst teaching Computing. During my first year of teacher training, I visited many classrooms. At the time, I was lucky to be in a school with more than ten Advanced Skills Teachers (ASTs). These were excellent teachers with a subject specialism, who had chosen to continue to develop their teaching in the classroom, rather than pursue pastoral or managerial leadership roles in school. Needless to say, these teachers had impeccable behaviour in their classrooms and the students seemed to be progressing at an impressive rate; naturally then they possessed a somewhat revered status. I remember going into one Religious Education class run by one of the school’s ASTs, Joanna. The class was studying Buddhism and in order to get them to empathise with Buddhist meditation, she asked them all to close their eyes and for five minutes, the students meditated in silence. I had just come from a lesson in which it took more than five minutes just to get my students logged on and facing the board! The students then returned to the present moment and wrote in silence for 10 minutes about their experience and why they thought Buddhists chose to meditate several times a day. I was impressed and for many years, I aspired to be just like Joanna, running a silent classroom where everyone was “working hard”. To facilitate this hard work, I thought that I should help my students by making the challenging tasks easier. By scaffolding all the tasks so that they could complete them effortlessly. I held the false belief that effortless perfection was what a teacher should be aiming for. The reason this was such a big mistake is that quiet classrooms are a very poor proxy for learning. Graham Nuthall discusses the challenges of knowing what students have learnt in his book, The hidden lives of learners*. Dylan Wiliam would argue (based on a course I attended) that a quiet classroom could simply be one where nobody is being stretched, where students are bored or where students are afraid of taking risks. Paul Black and Dylan Wiliam’s work on formative assessment and assessment for learning in Inside the Black Box* and, especially, Embedded Formative Assessment*, tells us that the best proxies for learning need to make the learning visible. A few solutions that they suggest are using mini whiteboards, exit tickets and traffic lights to quickly see what the students are thinking. Mistake 2: Should learning be easy? Mistake 3: Too helpful by far? The third mistake I made was scaffolding the learning for students with Low Prior Attainment (LPA) and then allowing them to become reliant on the scaffold for the remainder of the year. I remember printing out step-by-step worksheets for many students whilst teaching Spreadsheets, Databases and Control and the students would become reliant on these worksheets. Every lesson, students would ask for the worksheet, without trying the task first. David Didau and Oli Knight advise that in order to develop independent learners, scaffolding should only be provided if there is a plan for taking this away later on in the unit of work. Moving on from there, I now accept that lessons and learning may not always be effortless and smooth. I accept that students might struggle sometimes. Many concepts in Computing are quite abstract. Explaining the difference between a For Loop and a While Loop for example or explaining the use of Master Slides in presentations are both quite challenging concepts to grasp. However, I have taught my students to embrace the challenges, struggles, setbacks and mistakes; it shows that we are trying hard and therefore learning. • Teacher – Lastly ask your teacher. Other teachers use the 3B4Me model which is very similar, going through the Brain, Buddy, Book and lastly Boss. This helps students become more independent and whilst the scaffolding might still be provided through a video tutorial which can be made using free software such as Open Broadcaster Software (OBS), these tutorials or worksheets are the third option, only after they have tried solving a problem themselves and also attempted to get help from their peers. Examples of YouTube tutorials that I use in my lessons can be found here. Noel Burch developed a model citing the four stages of conscious competence. For many Computing teachers, they are teaching skills which they are already unconsciously competent. At this level, we might be considered experts and the expert’s trap is to attempt to teach something without explaining it fully. Collins et al. wrote a paper about Cognitive Apprenticeship in 1991, where they state the importance of making the thinking visible by thinking out loud. In applying this to Computing, many of the tasks we do and know are implicit. An example of this is closing a tag in HTML as soon as we open it. However, unless we make these implicit habits explicit, our students will be lost as they will not be able to make the invisible conceptual leap that exists in the minds of their expert teacher. In Computing lessons, I now try my best to model not only a skill but also my thinking. Thinking aloud feels very unnatural at first, but the gains are immediate and will be apparent in all lessons where you model the new skills well. Frequently, when I reflect on lessons which went less well, I realise that there was an issue with my modelling in that I forgot to think out loud and my students were lost in the silence of clicking and demonstrating. The media frequently use the terms “Computing”, “Computer Science”, “Coding” and “Programming” interchangeably and most headlines about the curriculum reforms in the UK have used these words synonymously. This distorts the reality that programming is a skill which all Computer Science students will need to learn, but it is not the only skill which is required in Computing. Programming pedagogy is an important part of a teacher’s Pedagogical Content Knowledge. However, equally important are other key software applications and the theoretical subject knowledge which the Computing curriculum is built on. When I first started teaching at my current school, I focused a lot of time and energy in teaching students how to program using Python. That was the programming language that they would eventually use for their GCSE controlled assessment which would make up 60% of their GCSE grade (for non-Brits: GCSE is the General Certificate of Secondary Education, which is usually taken in several subjects at 16 years of age. It is a school-leaving certificate, or a passport to further study). This decision was somewhat shortsighted, because what I realised is that the programming language is not the most important thing, neither is syntax. As I reflected back on two years of teaching programming with Python, I realised that the key threshold for learning how to program and to pull students out of liminality (transitional/borderline stage) is in teaching the students the importance of logical thinking. The key to ensuring that a program works (regardless of the programming language) is the logic and the Computational Thinking. Teaching students the process of how to break down a real-world problem down into a problem that can be computed is the key to successful programming. This is where the focus should be when teaching students how to program. However, this in itself only solves part of the problem. In 2015, the qualifications regulator for England, Ofqual announced a curriculum reform which resulted in all Computer Science Controlled Assessment from 2017 onwards to be worth only 20% of the grade. Fortunately, by then I had realised that I should be focusing on other skills, concepts and knowledge besides Computing and had started to build a more-balanced curriculum map. In designing a Computing curriculum, I have learnt not to focus too much on trends and exam boards. But instead to produce a more-balanced curriculum which will provide students with the ability to use digital technology creatively and independently. There is still a need to plan backwards from terminal exams, however the way in which we do this has to be measured and has to ensure sufficient spacing and interleaving of content. Medium term planning is itself a significant area which cannot be covered in sufficient detail in this post. However, it is something which I am happy to advise on by email or in-person. I will also be dedicating a chapter of my upcoming book to the topic. William Lau is the Head of Computing at Greenwich Free School. Having trained through the Teach First program in 2006, he has taught Computing from Key Stages 1 through to 5 in two London schools and in an international school in Seychelles. William is currently writing a book on Computing education and pedagogy. To enjoy further insights from William, follow him on Twitter: William Lau. * Links marked with an asterisk are Amazon affiliate links. Three years ago, the landscape for ICT teachers in the UK began to change. I realised that I would need to adapt to teach Computing, specifically Computer Science as the policy documents seemed to suggest that this was where the future of ICT was going. I’ve spent the last 2 years teaching Computing with a strong bias towards teaching Programming. This is what I’ve learnt so far. Some things are best learnt by rote. Programming is not one of them. Multiplication tables and French irregular verb endings are something which you will just have to remember. However, a function to calculate a multiplication table in Python is not something that any professional programmer would spend time memorising by rote. I remember when I first tested students, I expected them to produce working programs without referencing their prior programs or even using the Web. This is how controlled assessments and exams work in (say) Science so why not Computer Science. The reality is that, it’s not realistic or indeed necessary for 11 year old students to remember the exact syntax for sequences, selections or iterations. It’s not necessary at GCSE or A-Level (or even for professional programmers and software developers) to remember their past solutions. I did not know about this until I went on exam board training! My leveraged observation coach had once advised me to use SPOT to make students more independent and I now consider it a vital tool for teaching programming. Peer-Use your peers, ask the people sat next to you. Other-Use other resources. All good programmers use their old code, websites (including Youtube), documentation and forums. Because there are very few problems which other programmers haven’t tackled already. Teacher-The teacher is your last resort! He or She will be understanding and helpful provided you have exhausted all the steps above. In many Sciences, there is only one correct answer. Computer Science deceives us in that there is rarely only one correct answer! Linked to the previous mistake I made, I spent a lot of time in my first year by focussing on the correct solution. Too much programming and too soon! I was anxious to teach my students programming in their very first term in Year 7 for fear that they would not be able to complete their Controlled Assessment in three years’ time. Looking back, it is quite surprising that despite my insistence on drilling the importance of Python syntax, indentations and parentheses, my students still loved programming. I think it was because of the way the subject was sold. They knew that very few 11 year olds across the country were also writing programs using Python at the time. Whilst learning a programming language is an important part of Computing, something else needs to come first! My students were generally enthusiastic and enjoyed programming, but the focus was all wrong. JeannetteWing and Mark Dorling frequently speak about Computational Thinking and it is only after two years that the penny finally dropped for me. "For the first half-term we do nothing but logic problems without going near a computer (search CAS Online for good examples) and in the second half-term we look at basic Python programming, covering input, output, variables, assignment, if statements and loops (WHILE and then FOR)…"
Many other successful departments follow this approach of teaching the problem solving through Computational Thinking before teaching any programming. In summary, do not rush to teach students the syntax to a programming language. Teach them decomposition-how to break down problems into smaller ones first decomposition. Then see if they can recognise any patterns-have they solved something similar before? Is there any repetition within the problem? Get them to strip away un-necessary detail and form a general model-this is called abstraction. Lastly, before students start programming, they need to plan their algorithms i.e. they need to solve the problem by planning it step by step. Computing is a unique subject in that you will spend more time failing than you do succeeding. Mark Guzdial’s advice is to create an environment where it’s OK to make mistakes. Let students know that even their teacher will make mistakes. David Batty likewise emphasises how important it is to fail in front of your students and not to over-plan your code so that it is bug free. Do the programming live and debug it live. Nobody in the world can program without making mistakes. Mistakes are teachable moments; Guzdial goes on to state that you should then talk through your debugging slowly- This is what I thought, this is what I want the code to do, this is what I will try next. Referencing Collin’s research on CognitiveApprenticeship, Guzdial states that thinking aloud plays a pivotal role in helping students become better programmers. Karen Hume takes this rewards approach further by stating that we should reward less and celebrate more. Rewards can create a ceiling; once a student has been rewarded for success, they stop because they see success as a destination instead of a journey. Rewards also signal that the learning has not intrinsic value. By praising effort and celebrating student’s debugging, we’re more likely to develop successful programmers with a growth mindset. 1) Start Small. This is probably the single biggest piece of advice for programmers at every level. Of course it’s tempting to sit down and crank out an entire program at once. But, when the program – inevitably – does not work then you have a myriad of options for things that might be wrong. Where to start? … How to figure out what went wrong?... So, start with something really small. Maybe just two lines and then make sure that runs ok. Hitting the run button is quick and easy, and gives you immediate feedback about whether what you have just done is ok or not. Another immediate benefit of having something small working is that you have something to turn in. Turning in a small, incomplete program, is almost always better than nothing. 2) Keep it working. Once you have a small part of your program working the next step is to figure out something small to add to it. If you keep adding small pieces of the program one at a time, it is much easier to figure out what went wrong, as it is most likely that the problem is going to be in the new code you have just added. Less new code means it’s easier to figure out where the problem is. This notion of Get something working and keep it working is a mantra that you can repeat throughout your career as a programmer. It’s a great way to avoid the frustrations mentioned above. Think of it this way. Every time you have a little success, your brain releases a tiny bit of chemical that makes you happy. So, you can keep yourself happy and make programming more enjoyable by creating lots of small victories for yourself. Regular programming homework tasks and paired programming challenges during lessons ensure that students keep practising, and in a safe and secure environment where it is OK to fail. In fact failure must be celebrated as it means the student in question has moved one step closer to a solution. Computing consists of three strands, Computer Science, Digital Literacy and Information Technology. I knew this as I spent a whole year meeting Teach First ICT teachers in a focus group setting and we established that teaching only one of the three strands would be short-changing our students. The current Computing Curriculum also reflects this with all three strands equally weighted. With exam pressure however, I have undoubtedly spent 70% of the year teaching Computing, specifically the OCR syllabus for GCSE Computer Science. My rationale was that if they start in Year 7 or 8, by Year 11 they’ll be flying. Luckily, I started early and have had ample time to learn from my mistakes! The biggest mistake has been teaching to the exam, the assessments change and even our department’s GCSE options have changed. 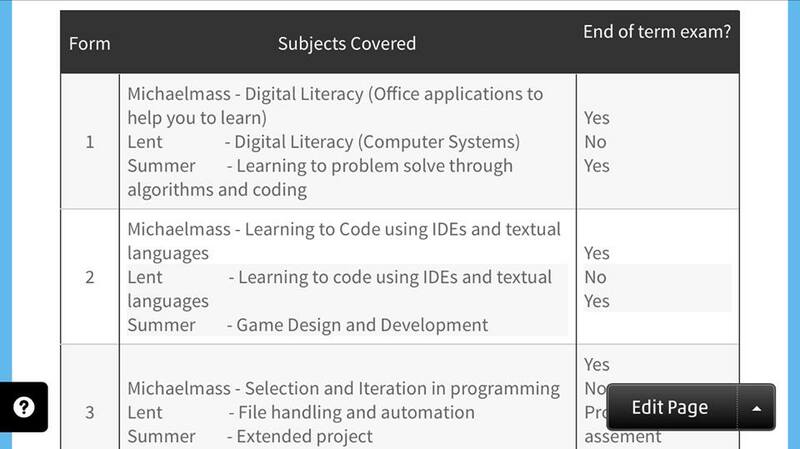 Having visited three successful Computing departments, I have learnt that it is important to offer a balanced curriculum from Key Stage 3, all the way to Key Stage 5. 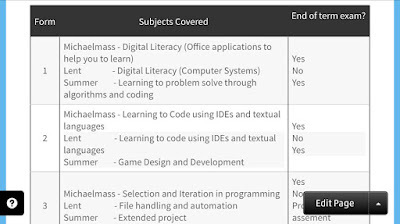 In September 2016, we’ll be offering GCSE ICT alongside GCSE Computer Science and as a result, I will be re-planning Key Stage 3 to reflect this. I know that ICT won’t last much longer in its current state but this serves as a reminder to be flexible; plan for balance and plan for change. Most of this post is about Pedagogy and is based on my own experience and the articles/videos linked throughout the document and below. I wrote a similar end-of-year reflection post last year which focussed on the logistics and practicalities of setting up a Computing department, you can read about that here. Many teachers have come to realise the power of metaphors. If this is not something you've tried or if you are slightly skeptical, I highly recommend this blog post by Alex Quigley (@HuntingEnglish). I've found metaphors particular helpful in Computing as there are so many abstract ideas and concepts. Metaphors, analogies and similes certainly make these concepts much more accessible to our 11-13 year old students! I've started creating some slides to document these and invite other teachers of Computing to contribute. Please comment if you have other suggestions. We've been waiting for a return visit from HMI for the past three weeks. In preparation, we've had two inspection teams from Outstanding schools and an actual HMI come in to look at the school. Initially, the workload increased massively in preparation for the inevitable monitoring visit. However, looking back I think it's all been worth it. As I've mentioned in a previous post, you cannot possibly prepare for an HMI visit in 24 hours or even a week, it takes weeks if not months and therefore I think the mock inspections have not only provided us with time to prepare but also lots of practice. As a result of the first of these issues, I've put more of a focus on modelling during the Do Now and before the main activity. In addressing the second issue, I've been more aware of when I'm giving instructions, where I am and how I deliver these instructions. Certainly the worst way to deliver them is sat down! I've also noticed that in some cases I have been leaning or supporting myself with a chair or the mobile white board! I'd be the first to admit that this is not the kind of body language that is favourable for information transmission or simply getting the attention of kids. I corrected this and am more conscious about this than ever before. On a more positive note, I found noticed that traffic light cards and mini whiteboards, simple as they are work well. By forcing students to have 100% participation, everyone has to think to respond and therefore will learn a lot more. Linked to student participation, our observers also noted that we should script our questions more. The only way you can use questioning effectively is if you plan the question and plan who you will ask it to. This way your expectation of a student response (no opt out) can be met in the first instance. Looking ahead to Monday's monitoring visit, I'm feeling confident because I've made so many mistakes in the past 3 weeks and indeed over the past year that I've learnt a lot and improved my teaching as a result. Looking back over the year, it is the most difficult and daunting things in teaching that offer the most benefit. Line management observations, filming yourself and being scrutinised by 3 different sets of external inspectors in 3 weeks have all been challenging and at times slightly uncomfortable. However, every significant success I have had this year has come about through either one of these forms of observation or the reflection/debriefing on these afterwards. What do all outstanding teachers have in common?